When University of California Press asked me, in 2001, to write a wine book of my choice, I had no doubt I wanted it to be “A Wine Journey along the Russian River.” It records a year of my travels along this beautiful wine river, with the colorful places and people it’s famous for. You’ll also find lots of interesting information on weather and climate and plate tectonics, including the first (so far as I know) theory of how and when the Russian River came to be born. But the focus, of course, is on vineyards, winemakers and wine. 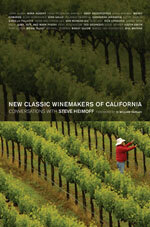 My second book for University of California Press is an hommage to one of my favorite wine books of all time, Robert Benson’s 1977 “Great Winemakers of California.” “New Classic Winemakers of California: Conversations with Steve Heimoff” consists of conversations I had with some of the most interesting and talented winemakers working in California in 2005-2006, when I wrote it. One reviewer said the reader feels like a fly on the wall, listening in to the back-and-forth. 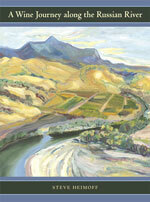 I was honored that so many publications listed this book as one of the best wine books of 2007.